Nation's biggest marine park | Daily Express Online, Sabah, Malaysia. 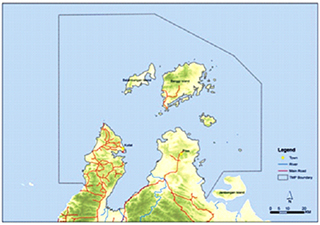 Kota Kinabalu: The State Government has officially gazetted 898,762.76 hectares in the northern seas of Sabah as the Tun Mustapha Marine Park. State Tourism, Culture and Environment Minister Datuk Seri Masidi Manjun (pic) tweeted the new marine park, Thursday, as being the biggest in the country and the newest conservation initiative carried out by the State Government. "It's done! Tun Mustapha Marine Park in northern Sabah is gazetted," he said, accompanied by a photo of the State gazette dated May 19. The park is located off Kudat, Kota Marudu and Pitas right up to the Straits of Balabac, where the Sulu Sea and South China Sea meet in the northern part of Sabah. With the declaration, the size of protected marine parks in Sabah now stretches to about two million hectares. "Efforts to gazette the park have been carried out through consultations with various parties with interests in the area," he said. The area covers 50 islands and includes the three main ones of Pulau Banggi, Pulau Balambangan and Pulau Malawali with more than 180,000 people living in the coastal areas and islands. It was earlier reported that such a move was the only means of protecting sharks in the area due to the reluctance of the Federal Government to legislate a ban on shark hunting. "The area is rich in various marine life and located within the coral triangle covering waters within Luzon Island in the Philippines, Bali in Indonesia and the Solomon Islands in the Pacific Ocean. "The triangle area has over 500 species of corals that is the habitat of numerous marine life. This includes 243 invertebrate species, 550 fish species, four species of turtles, dugongs, crocodiles and sharks," he said. As an open marine park, the Tun Mustapha Marine Park will be managed through a collaboration between various bodies involving both government and non-governmental organisations, as well as local communities, said Masidi. Towards this end, he said the areas are divided into six zones, involving a conservation zone, community-use zone, multi-use zone, commercial fishing zone, special fish management zone and aquaculture zone, adding that the park was gazetted under the International Union for Conservation of Nature (IUCN) Category Six. This involves protected areas being set up to conserve ecosystems and habitats, together with associated cultural values and traditional natural resource management systems. The marine park was first proposed in 2000, with the State Government approving its establishment on March 5, 2003. The gazzeting of the park had undergone various stages like public hearings from 2014 to 2015 as well as public consultations on the park zoning from 2012 to 2013. The framework of management plan was drafted in July 2012 and was completed along with its gazetting plans, with the government planning to launch the new marine park in June this year.